Updating your home decor is a fun way to spruce up the look of your house, but it can be expensive to redecorate a room if you shop at big box stores. Have you ever thought about repurposing building materials to make one-of-a-kind decor for your home? Manufactured to reduce noise, acoustic tiles (also called acoustic panels) resemble canvas boards. This quality makes them a natural as “frames” for artwork. They'll add a touch of elegance to any room. Concrete cinder blocks are heavy, so draw a precise design plan first. Then let the purpose drive whether you paint the blocks or leave them in a natural state. For example, if you’re using the hollow chambers of the cinder blocks as a practical resting place for shoes, you may not care if they’re plain gray. Cinder blocks are very sturdy, which means you can put a piece of plywood over the top and create wall-to-wall seating for any room in your home. You'd probably want to paint a window seat, as you would a bookshelf for your family room or living room. An unfinished look, meanwhile, might suit a grouping of staggered cinder blocks for a container garden. 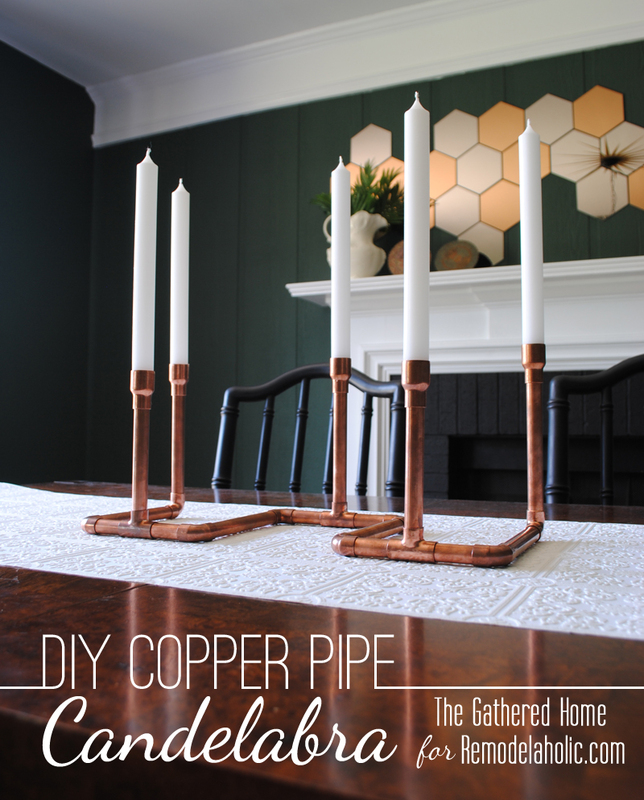 In the dining room, copper pipe can be transformed into a candelabra. In the kitchen, it holds pots and pans. And because you wanted a portable table to hold your ever-portable laptop, it makes a statement everywhere it goes. None of these pieces would be possible without copper pipes, added here on a technicality. (Copper is getting expensive and is often replaced by polyethylene flexible tubing, more commonly known as PEX. But copper piping constitutes a real find if you find some discarded sections targeted for disposal.) A pipe cutter is a must for these projects. For thinner diameters – those of ¼ inch or less – an auto cut pipe slice is the superior choice. It might not qualify as an “alternative use,” but spreading cork across an entire wall gives you a practical, affordable option for kids who cannot resist tacking posters, ribbons and keepsakes on their walls without a barrage of push pins and plastic tape. Using cork on a full wall has become so popular that you can find pre-made cork as a wall covering. And if you have a few sheets left over? Bind them together and tack them outside the shower or bathtub for an absorbent, slip-proof surface. You'd be hard-pressed to find a raw material that you can bend to your will more easily than sheet metal. Early DIYers especially liked fashioning the sheets into the form of front doors. But these ambitious types were just getting started. Steel is often pressed into duty during kitchen remodeling projects, providing a sleek and durable substitute for granite countertops and tile backsplashes. If you’re looking for something a little more feasible to make yourself, similar to the cork board, you can use steel sheets to create a wall magnet board. Pro tip: Adhere the steel sheet inside a painted frame and it will look extra polished hanging on the wall. You may see one contractor install plywood on your roof while another uses it for subflooring. This is because there are many types of plywood, and its varying thicknesses makes it a go-to choice for many building projects. Most plywood varieties are strong and durable since the layers are glued together at alternating angles to prevent the wood from cracking and warping. This is precisely why plywood is ideal for shelving; it can hold heavy books as easily as it suspends light decorative items. So, whether you have unused materials in the garage at home or, perhaps, the next time you visit Twin Cities Habitat for Humanity's ReStore, we hope this inspires you to roll up your sleeves and make something different with these common building materials.